Retailers may be closing some store locations, but the ones they are keeping are embracing technology to compete with online shopping. Some stores are bringing in facial-recognition technology to alert salespeople that a customer in their loyalty program has walked in. Others, tapping into the popularity of how-to videos and social media, are installing mirrors that double as video screens and cameras to record a makeup artist’s step-by-step application, which then can be sent to the customer’s phone. Still others are fine-tuning inventory management to align workers more closely to traffic patterns in their stores. “Retailers are saying, we’ve done the pruning, now we need the comps to go up,” said Mark Ryski, chief executive officer of Headcount Corp., a company that studies and helps business with retail traffic and conversion analysis. Comps refer to same-store sales compared with the previous year. According to Euromonitor International, a market-research provider, total U.S. store locations declined by 0.1% in 2017 from a year earlier, the first downturn since 2009. Because many of the locations closed last year were large-format stores, the volume of retail real estate space fell by a more sizable 0.6% to 8.52 billion square feet. One of the issues increasingly straining negotiations between retailers and landlords these days is foot traffic. Retailers have been blaming declining numbers of walk-in traffic for their weak sales, but landlords say some tenants have neglected store upkeep and should shoulder the blame if customers walk out without making a purchase. Headcount Corp., which has done some exit surveys with customers who came out empty-handed from a general merchandise store, found out that those who were planning on buying something said there were no sales associates, the checkout line was too long or the store didn’t carry the desired product. “Retailers were not taking money fast enough,” said Mr. Ryski. The goal at the heart of these efforts is to get back to the basics of providing good service to customers, ensuring products are displayed prominently, and having responsive sales associates to keep brands relevant, all of which increase the chances of ringing a sale from a walk-in customer. U.S. phone carriers such as T-Mobile, for instance, are looking at centralizing planning of tasks such as stocking stores with new merchandise, making it easier for managers to stage new products the exact way headquarters wants it done. Mobile and consumer-electronics retailers are more adept at using their stores to help consumers experience the products, and improving the communication between headquarters and individual stores with plans updated on a cloud would make them more agile, said One Door, a Boston-based software company that helps businesses keep track of floor plans, fixtures, inventory and remodels in each store. “This enables store associates to maximize time spent with customers rather than in stockrooms,” said One Door President and Chief Executive E.Y. Snowden. Retailers that started out online have set a high bar on selection, price, availability and speed of service, and bricks-and-mortar retailers must differentiate themselves, said Joe Jensen, vice president and general manager of Intel Corp.’s retail solutions division. 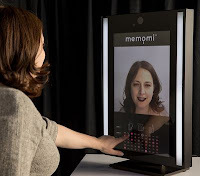 Intel has joined with MemoMi Labs Inc., which enable consumers shopping for new clothing, beauty products and eyewear to share pictures and videos taken by “memory mirrors” at luxury retailer Neiman Marcus and shoe retailer Finish Line in the U.S. and Sephora stores in Europe. “The biggest misconception out there is that the technology is nascent. The technology is mature and ready for scale said Intel's Mr. Jensen.